There are many divers who harbour a dangerous secret. Hermione is one of them. On a recent dive, the latest of over 200 she has done over the past 12 years, the unthinkable happened. Despite having carefully followed her usual predive cleaning routine, her mask started fogging up halfway through the dive. Her guide was pointing out small creature after small creature, and eventually the fog became so thick she could not see what he was showing her. She screamed into her mouthpiece in frustration and the guide, looking at her, indicated that she should clear her mask. She dimly perceived his signals through the mist and squealed again, signalling with her thumb that she wanted to go up. They ascended and when they arrived at the surface, Hermione made herself positively buoyant, took off her mask, flushed it out, spat in it, wiped the spit around and flushed it out again. Then she replaced it carefully on her face and brushed a couple of rogue strands of hair out from beneath the rim. Hermione’s secret, one shared by more divers than you would imagine, is that she goes on every dive terrified of getting water into her mask and onto her face. So she is certainly not going to voluntarily allow water to enter her mask so she can defog it. She knows that if she does this or if her mask ever fails in any way, there is a good chance that she will panic and bolt to the surface. She therefore spends every dive subconsciously aware that she is potentially only seconds away from disaster. Yet she is so keen on the sport that she continues to dive, hoping that it will never happen. Over time, this hope turns into a misplaced conviction. The false logic she applies is that if she has done x hundred dives and has never had a mask leak, been caught by a flying fin or had a mask strap break, then none of these things will happen on her next x hundred dives. And, if her mask fogs up, she can always ascend and sort it out at the surface, even though this may spoil the dive. It does not feel natural for anyone to have water covering their nostrils while they are breathing through their mouth. A lot of people understandably become anxious in such circumstances, worrying that they may inadvertently inhale water and choke. However, it is a common experience for divers. This is why they are taught in their beginners’ course how to deal with water in their mask and manage any anxiety. They are also taught how to deal with an emergency situation where they lose their mask completely and have to either replace it or ascend without it. Nevertheless, as we see from Hermione’s example, evidently there are people who manage to become certified divers without actually learning to master these skills or manage their anxiety. How does this happen? The fact is that some people need more time to learn things than others, especially when they have to overcome deep-seated fears. Today, with large classes and tight schedules, there is often little time for extra lessons or additional one-on-one sessions. Both students and dive centre bosses also expect a 100 percent pass rate on courses. So, instructors are under pressure and this allows the Hermiones of this world to beat the system. Here is one case in point. A friend of mine had a new girlfriend. The girlfriend was a diver and wanted my friend to learn to dive so they could go on dive trips together. But although he could swim, my friend had a fear of the water. So I was surprised to find out that he had completed a diving course and that he and his girlfriend were planning a dive trip. I congratulated him on overcoming his fear of water. “Well,” he said, “there were a couple of things I couldn’t do.” He went on to explain that, in the pool sessions, he had been unable to fill his mask and clear it without panicking and popping to the surface. I asked him how he had managed to pass the course and he told me that, after a few failures in the pool, his instructor had told him that he should not worry about filling his mask and clearing it, let alone removing and replacing it. 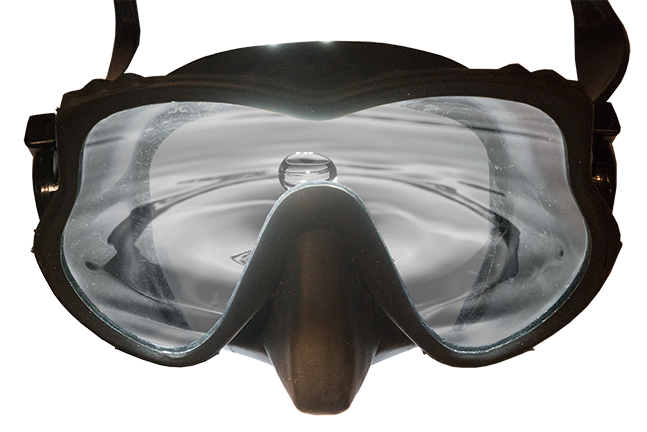 All he would ever need to do as a diver was to be able to exhale through the nose to expel any dribbles of water that got into the mask, and if he could do that, then he would be fine. My friend of course was delighted to hear this and was certainly not going to question what the instructor had told him. He now had his card and carefully avoided diving with operations that require divers to perform mask skills during checkout dives. I once asked him why he thought new divers were taught how to clear a filled mask or breathe underwater without a mask on, he said that he guessed it was just a challenge thrown in to see how tough they were. “What if your mask strap snaps during a dive or someone bashes you with a fin and your mask goes flying?” I said. He looked at me in shock, having never contemplated either possibility. The following week, he signed up for a couple of private pool sessions with a local instructor. The solution to this problem is similar to the one my friend came up with: mask clinics. Dive clubs and dive centres often run pool sessions during the off season to keep divers involved and give them opportunities to practise their skills. Some of these sessions should be designated exclusively as mask clinics. 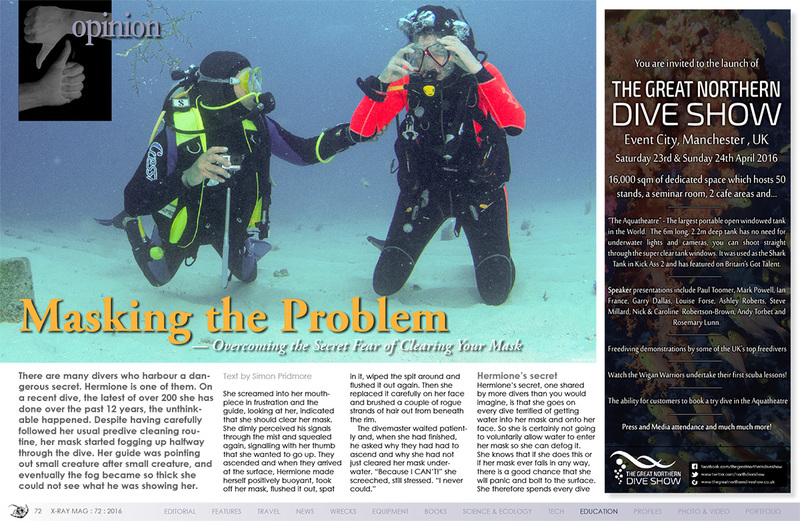 They would be open to all divers at all experience levels so that attendance would carry no stigma. Nobody would risk any embarrassment by attending. Technical divers could practise stress tests; advanced divers could work on achieving higher levels of no-mask confidence and newer divers could practise mask clearing, replacing a mask or just surface swimming with no mask at all. Perhaps instructors and divemasters could also develop games and competitions to help build diver confidence and make the sessions more fun. Simon Pridmore has been part of the scuba diving scene in Asia, Europe and the United States (well, Guam) for the past 20 years or so. He is the bestselling author of Scuba Confidential: An Insider’s Guide to Becoming a Better Diver and has just published a new book entitled Scuba Professional: Insights into Scuba Diver Training & Operations. Both are available from Amazon in a variety of formats.